I love this sandwich because its my kinda combination. Simple and luxurious! Plus, is there a better chicken lover than avocado? They were born to be lovers, wouldn’t you agree? 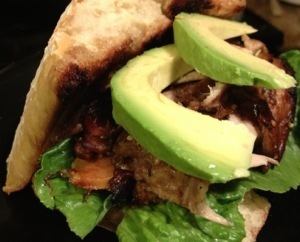 I decided to make this when I needed a sandwich to accompany pumpkin soup on our ‘soup and sandwich’ night. I wanted something flavorful and hearty while comfortfoodish enough to stand up to the silky, creamy, lovely bowl of goodness I had planned. The cool creamy avocado. The sweet cool crunch of romaine lettuce. 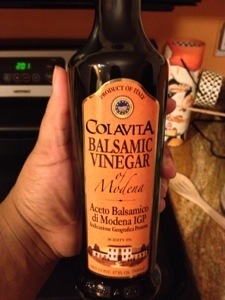 The distinct balsamic garlic flavor of the chicken…I’m hungry! Here we go. You already know, unless we are baking, I don’t believe in strict recipes. The best way to increase your kitchen prowess is to learn food and the best way to do that is guided experiments. I used skinless boneless chicken thighs. They are moist and the fat chars nicely under the broiler. 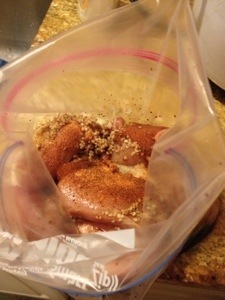 Next, rinse the chicken, pat it dry with paper towels and throw it in a bag for a marinade. Now broil or grill the meat. Remember not to eat up the meat before you get to the sandwich. Next, wash your lettuce and slice your avocado. Butter your ciabatta and grill it up till its golden, buttery ,soft and a little crunchy on the edge. I almost ate all of the bread before the sandwich was assembled. I should be ashamed however…I am not! Slather some mayo on the ciabatta. (It’s getting good folks.) Place your lettuce, chicken then avocado. Make sure you have a piping hot mug of pumpkin soup on the side. Previous Post Bento boxes from last week + some Pirate’s Booty!